Mobilizing for Women at the Wall – Where is the Outrage for Simple Human Rights? There is something sadly skewed with my community’s moral priorities. I’m sure many of you have been following the growing uproar – in Israel and America – over the curtailment of women’s prayer rights at the Western Wall. 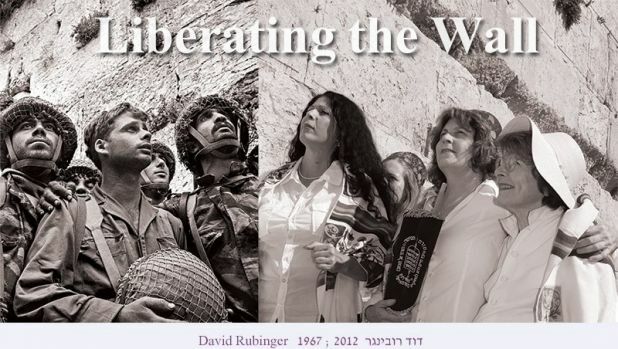 In protest, an Israeli group called the “Women of the Wall” has been holding monthly services there for the past twenty years, advocating for their “social and legal recognition of (their) right, as women, to wear prayer shawls, pray and read from the Torah collectively and out loud at the Western Wall.” This right, of course, is denied by the Israeli foundation that essentially runs the site – widely considered holy by Jews the world over – as the world’s most famous ultra-orthodox synagogue. The cause of the Women at the Wall was recently re-galvanized when its chairwoman Anat Hoffman was arrested for wearing a prayer shawl and leading a service there. Since then protests have been spreading across the US – led by an organization called “Wake Up for Religious Tolerance” that has organized monthly solidarity services throughout the Jewish community. This was hundreds of people with different beliefs coming together to fight for one thing they all have in common—Jewish equality. Oh, would that the Jewish community might galvanize this level of moral outrage for the cause of simple human equality in the state of Israel. “The interrogation mixes intimidation, threats and physical violence, with the clear purpose of forcing the child to confess,” it said, noting they were restrained during interrogation, sometimes for extended periods of time causing pain to their hands, back and legs. “Children have been threatened with death, physical violence, solitary confinement and sexual assault, against themselves or a family member,” it said. Most children confess at the end of the interrogation, signing forms in Hebrew which they hardly understand. It also found children had been held in solitary confinement for between two days and a month before being taken to court, or even after sentencing. During court hearings, children were in leg chains and shackles, and in most cases, “the principal evidence against the child is the child’s own confession, in most cases extracted under duress during the interrogation,” it found. “Ultimately, almost all children plead guilty in order to reduce the length of their pretrial detention. Pleading guilty is the quickest way to be released. In short, the system does not allow children to defend themselves,” UNICEF concluded. People traveled to the event from as far away as Philadelphia. Similar gatherings took place around the U.S., including a demonstration outside Israel’s embassy in Washington, D.C. on Monday, and solidarity prayer services in Cleveland, Chicago and at Brandeis University and the University of Pennsylvania, said service organizer Rabbi Iris Richman. A “sing in” is slated outside Israel’s consulate in San Francisco for Sunday. In fairness, I’m sure many of the individuals involved in these actions have also advocated for human rights in Israel/Palestine. But the sad truth is that our community would never see fit to mobilize this scale of collective protest in support of Palestinian children. It is well within our comfort zone to protest at Israeli consulates on behalf of Jewish rights. For reasons I understand all too well, universal human rights are still well outside that comfort zone. This entry was posted in Children's Rights, Human Rights, Israel, Palestine, Religion, UN, Women's Issues on March 13, 2013 by Rabbi Brant Rosen. I believe that a sad truth underlies the dichotomy you raise. That truth is that as a community, nay, as a culture, we Jews have been taught in subtle and unsubtle ways, that we ARE the “chosen,” and that we really are somehow better, more human, and closer to God than all the other peoples of the world. Until and unless this xenophobic element of our culture is acknowledged, discussed, addressed, rooted out, and eliminated, I fear your comments will remain true. Looking forward to meeting you in Seattle in May, Michael. Christians teach that they are closer to heaven, that they are chosen and better and more human. Muslims teach that they are closer to heaven, that they are chosen and better and more human. All cultures and religions teach that they are better and have superior vaues. Even secular “progressives” believe they have the truth, that they have the right to impose their values on everyone else, even if they go trumpeting that they are “multicultural” and “pluralistic”….. in saying this they are claiming they are superior to those who don’t think like they do. People who profess the religions mentioned above are not necessarily intolerant because they hold these views. A tolerant person can believe that he realizes that not everyone thinks like he does and that other religions teach universal values that we can all agree on. It is on this basis that “parochial” Judaism can take its place in the world with the other religions. I certainly hope that they as well can take a tolerant view of things. Sorry, Ike, but your comment on the Women of the Wall precludes me from taking anything you say seriously. Of course, you don’t take most people that disagree with you seriously. Regarding the “Women of the Wall” (WOW), it is important to note that it is a disgrace for them to use the Western Wal as a platform for demonstrations and provocations that disrupt the sanctity and decorum of the location. I know this may sound shocking to people here, but women have no “right” to wear a tallit and read from the Torah out loud there, because these are not part of the decorum of the location. Orthodox Judaism does not share the “progressive” values of the liberal Jewish movements and that’s just the way it is, whether followers of these liberal movements like it or not. The prayers there have been conducted according to Orthodox tradition since 1967 and even before 1948, althought there was no ‘mechitza’ (division between men and women) not because the worshippers didn’t want one, but because the British and Muslim authorities who controlled the site wouldn’t allow one to be installed. It is true that the Western Wall is holy to all the Jewish people, but so are all synagogues and all Jews have the right to pray in any synagogue they wish. yet each congregation is given the power to determine what customs are followed in each synagogue. No one has a right to come into any synagogue and claim in the name of “freedom of religion” to change the customs against the will of the regular congregaton. Almost every person who has come to the Wall since 1967 comes to pray in the Orthodox style and no minority has a right to overturn that particularly in such a provocative way. There are plenty of non-Orthodox congregations in Jerusalem where they can do whatever they want and I would also be in favor of granting them permaenent presence at some other location near the Temple Mount to do what they want. However, what they are doing, in the name of “freedom of religion” is comparable to having a group of Jews for Jesus/Hebrew Christians coming to your Evanston congregation and demanding the right to preach that Jews should start worhipping Jesus, or, alternatively, if a group of Haredim showed up one day and demanded, in the name of “freedom of religion” to start conducting the prayer services there in the Orthodox style. The only conclusion I can come to is that these WOW people are NOT interested in piety and religious devotion but simply in antagonizing people which is totally outside the true spirit of Judaism. Orthodox Judaism does not share the “progressive” values of the liberal Jewish movements and that’s just the way it is, whether followers of these liberal movements like it or not…[A]lmost every person who has come to the Wall since 1967 comes to pray in the Orthodox style and no minority has a right to overturn that particularly in such a provocative way. In short, if you are going to define ‘tradition’ as ‘what is statistically most common’, there is a risk that you miss out on a lot of richness. I’m not actually trying to change your mind on this. I accept that you are probably never going to feel comfortable with public Torah readings from women as it doesn’t fit with your halakhic understanding. The principle issue for me is the way in which you so routinely assume that you know exactly why other people are doing as they do and thinking what they think. The Women of the Wall are dismissed as provocateurs who want to take over the site, not really interested in piety – and all this on the basis of how you interpret their press coverage, without you knowing a single one of them. It doesn’t stop at religious matters either. You are often quick to judge other people’s motives, usually on flimsy grounds – a peace activist in Palestine must have spurious intentions if she hasn’t also written about Syria, a teenage refuser must be an arrogant creature because you don’t happen to like how his face looks in a photo. I hesitate to write this next part, because I do have some respect for you and I don’t want to injure your feelings, but if I were to judge you (and orthodox Jews as a whole) in the same way on the basis of how you write sometimes, that judgment would not be flattering. But it’s not my place to make that judgment. I don’t know you, and even if I did, I’m not equipped with the ability to mind-read – it’s not for me to say what people are. You may disagree with someone, even dislike them outright, but what does it cost you to believe the best of them? I’m religious myself, and I know that while unjust judges are condemned multiple times, God has never found fault with anyone for being too merciful. Vicky, as usual, your intelligence and compassion are just spot on. I wish I could access even a small measure of both. Thank you for your thoughtful reply. If you carefully read what I wrote, you will note I did not condemn them for deviations from halacha….I am aware of the sources you brought regarding women receving aliyot to the Torah and wearing tefillin. You will recall that I supported giving them an alternate location near the Kotel (e.g. Robinson’s Arch) as a permanent location to do whatever they want. I am even willing to break ranks with much of the Israeli Orthodox community in backing giving governmental financial support for non-Orthodox congregations in Israel. What I do strongly object to is using the Kotel for a demonstration of this nature. I am sure you saw the comment on another site where someone who is sympathetic to the WOW was somewhat disturbed by the commment by an MK who said explicitly that they are not observant and came explicitly for the purpose of making a demonstration. This is completely at odds with what the Kotel is supposed to represent….a place where all Jews can come and pray and medidate in a peaceful environment. The fact is is that the Kotel is run along Haredi lines, whether we like it or not (I am not Haredi) and has always has been and 99.9999% of the people who have come to the Kotel over the years, come there accepting that the services are conducted along Haredi lines. Zionism was and is all about Jews working together in peace and cooperation. Making demonstrations and provocations at such a holy place simply to shove ones views in someone elses face is the antithesis of this We are seeing more and more attempts by Progressives to attack traditional Judaism, such as banning kosher shechita and brit milah and there is no doubt that at least some of those making these provocations at the Kotel have a more far-reaching agenda than others there. You saw the comment above that completely dismissed what I said simply because I made politically incorrect statements. Whether you agree or not, I view the provocations at the Kotel as being part of this wider war, even if many of the participants don’t think in those terms..other’s do and I view them as hijacking the intentions of the others. A core problem blocking outrage for simple human rights is a sense of “chosenness” and its twin “specialness”, from which many people and nations suffer, allowing us to discriminate against and mistreat people not “like us”. “We” are better because “we” are “chosen” and/or “special”. “Others”, then, may be mistreated at will because we’ve placed them in a category of “less worthy than” us. When we learn to treat every being as “special”, the spectre of violence and mistreatment begins to wane. Until we do that, we condemn ourselves and our future. In this regard Israel and the US are much the same, and so are we, the people until we remove our blinders of “specialness” and see one another as special and deserving of being treated with respect and dignity. To echo the beginning of the article, I’m sure many readers have seen the talkbacks to all the articles about Women of the Wall and their supporters. If so, you’ve probably seen accusations from the right that WOW fails to assert Jewish women and men’s rights to the ultimate Kotel: the Temple Mount. Less often, but regularly, the charge is WOW’s neglect of Palestinian rights. Either way, it’s almost invariably men who are telling the women in so many words that the WOW’s concerns are frivolous, compared to the larger cause. As if any of us has only a single cause. 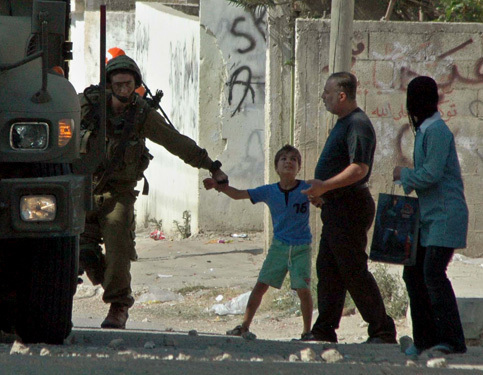 Yes, the treatment of minors in Israeli prisons is deplorable. It’s not the whole problem, though; it’s a manifestation of it. Likewise, Women of the Wall. It’s symbolic of larger injustices in Israeli society that almost certainly disturb most readers here, and it galvanizes support because the affront is more personal. Most of us are not agunot, riders on segregated bus lines, soldiers whose voices are silenced at their own induction ceremonies. But the knowledge that friends and peers have been detained for donning a tallit at the Kotel stings. “There but for the grace of Shechina” always hits home. So does drama. Over 24 years of Rosh Hodesh services at the Kotel, support from abroad escalated when chairs and recriminations flew over the mehitza, not when services were blessedly uneventful. Isn’t it the same with our other causes—including opposition to the Occupation, for those who see its pernicious effects? As I’ve said to the Temple Mount talkbackers, Women of the Wall is largely a one-issue organization. We come together from across the religious and political spectrum, despite our differences, in sisterhood, demonstrating possibilities that could at last bring about the dawn of redemption. For all. I respectfully take issue with your insinuation that my criticism of WOW is sexist and dismissive of women’s concerns. It is not accurate, nor fair of you to base your understanding of this criticism on anecdotal comments in online articles. There are, of course, many women who agree with the challenges I’ve leveled here. I don’t believe these kinds of claims are helpful to your cause. I agree with you that Israel’s abuse of Palestinian children is part of “a larger injustice” – however, I believe you are very wrong when you connect your cause to theirs. The larger injustice, quite simply, is Israel’s insistence upon a ethnic national project that privileges Jews over non-Jews. I’ll stand by my original analysis: WOW is about Jewish rights within a Jewish state. It is disingenuous to connect this cause to a larger injustice in which non-Jews are occupied and oppressed by a Jewish military regime. This subject is quite complicated, yet uncomplicated. Rav Brant, you are right that as a community we must be morally outraged and act to change any system that harms any child, or adult, in this way. You can also see from the above comment that women continue to be demeaned and harassed for the simple act of praying at a holy site, in this case as full Jews. Support for Women of the Wall (WOW), a group of ORTHODOX, Reform, Conservative, Reconstructionist, Renewal and non-affiliated Jewish women who wish to pray together aloud, read from the Torah, wear tallitot, etc. did not come easy, and has been hard won. It has taken twenty-four years to garner this level of support for women’s rights at the Kotel! For many years these holy women were completely marginalized and unsupported, in Israel and in the Diaspora. Finally consciousness has been raised. Please understand that women’s rights are human rights. When women have rights, children have more protection. Women’s rights, along with children’s rights, must be fought for at every step, by all communities. Interestingly, WOW members are a mixed group politically, from right to left. You are right that many have advocated for human rights in Israel/Palestine. They have, and they still do. One does not cancel out the other, and it is my hope that the experience of seeing the reality of encroaching discrimination towards women in Israel—separate sidewalks, sitting in the back of the bus for women (now thankfully illegal but not always enforced), spitting on girls who are not “modestly” dressed, etc., will help open the eyes of everyone to seeing all of us (fill in label) as human, deserving of human rights. once again Brant you have written a very compelling story of what is happening In Israel now.As far as the women wanting to wear prayer shawls to pray the ultra Orthodox have once again showh there archaic treatment of women.And to arrest them is an outragw.As far as the Palestinians being held in prisons where the treatment is inhumane leads one to wonder wxactly what the Israel goverment has become.We most all protest in out rage for the men womwn and children who are syffering under these conditions. I retract my insinuation of sexism with apology. Not only is it getting me in trouble on Facebook as well as your blog, but I now recall a female Temple Mount accuser among those anecdotal sources (which are not my only ones). And plenty of women say, why the Kotel and not agunot? Maybe I should generalize in terms of issues instead of gender! I can’t think of any instance of an environmental rights activist telling WOW that literal air quality must trump the quest for spiritual freedom. Noting the irony of a parallel on the right to your criticism doesn’t mean that I’m insensible to my privileged position. And I did not mean to imply by my ending that I think there is only one amorphous cause. To be clear: Just as abuse of Palestinian minors is a manifestation of greater injustice, so too Women of the Wall, but it’s not the same injustice. I may see connections that you don’t, but in saying that WOW is symbolic of larger injustices in Israeli society, I meant to draw a distinction. I completely agree that WOW is about Jewish rights within a Jewish state. Our argument stems from my not accepting this as the problem. I’m proud to have been part of a group that bridges differences to uphold these rights. But I understand Jewish privilege better than you think. I certainly understand your point about the Palestinian parents. Privilege implies responsibility. I don’t need to subscribe to a JVP analysis to feel obliged to direct energies, dollars, and “moral outrage” opposing much of what the Israeli government does in my name to Palestinian minors and their communities. So I would have no problem with your asking where the moral outrage is, if the question was accompanied by greater understanding of WOW and its supporters. I gave a couple of reasons why WOW’s cause may feel personal and immediate now, but I’ll add now that for me, and I believe others, it’s also a different understanding than yours of what responsibility Jewish privilege confers. I absolutely believe it means upholding Jewish rights within a Jewish state. Just to note, when you say, “It is well within our comfort zone to protest at Israeli consulates on behalf of Jewish rights,” that may be true for most of your readership, but it cannot be assumed in terms of WOW supporters at large. I don’t have a problem with it, but I can testify that there are staunch supporters of WOW who did not turn out because the rallies in their communities were in front of consulates. WOW has grappled from its earliest days with how to express both love of Israel and critique. It’s constructive struggle, IMHO.